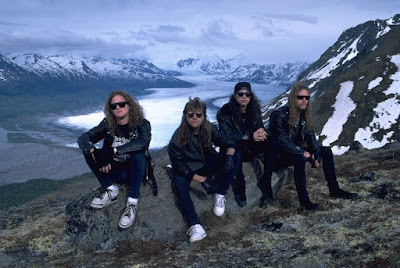 Metallica are streaming a 1991 live performance of their classic track, “Harvester Of Sorrow”, as the second installment in their live video series of songs from their 1988 album, “…And Justice For All”, ahead of the release of its expanded 30th anniversary reissue on November 2. “For the next nine weeks, we’re going to celebrate #30YearsOfJustice with a live video of each song from the record,” said the band when they launched the series with a clip of “Eye Of The Beholder” from a 1988 show in San Francisco, CA. The footage of “Harvester Of Sorrow” was filmed at the Monsters of Rock Festival in Donington, England on August 17, 1991. The band’s fourth album – their first with bassist Jason Newsted – reached No. 6 on the US Billboard 200 on its way to sales of more than 8 million copies in the country. The remastered "…And Justice For All" reissue will be available in multiple configurations, including a Standard Double 180 gram LP, Standard CD, 3 CD Expanded Edition, cassette, Limited Edition Deluxe Box Set and digitally as a Standard album (available to stream and download), an Expanded Edition (available for download only), and a Digital Deluxe Box Set (available for streaming and download). The 3-CD set includes the remastered album, two discs including never before released rough mixes, demos and live tracks, and an expanded booklet including unseen photos by Ross Halfin. The limited edition, one-pressing-only deluxe box set includes the remastered CD and double LP versions of the album, “One” 10” vinyl picture disc, triple live LP set featuring a newly mixed version of the band's iconic show from Seattle ‘89 by Greg Fidelman, 4 DVDs, 11 CDs of unreleased demos, rough mixes, interviews and live tracks, many of which have never been available and were pulled from the band members personal collections.